APEX GAS SPRING is rated 4.5 out of 5 by 8. Rated 5 out of 5 by Siang from Great Price I bought this product through online, it's an amazing product. Easy to install. Rated 4 out of 5 by li33ieg from Good, but lacks durability As long as they continue to work, these things are great. We have 2 x 12kg gas springs installed in the kitchen cabinet above our sink, which opens horizontally to reveal a draining rack. Obviously, we need the door to stay up whilst we're washing up or we wouldn't be able to use the rack. The only problem with this arrangement then is that the hinges only seem to last for a couple of years before the gas mechanism fails and cannot manage to hold the door in place any more. (Note: the door doesn't weigh anything close to 24kg so I don't feel we are asking the springs to do any more heavy lifting than they claim to be capable of.) On the plus side, they are not only affordable but really easy to fit without having to use any more complicated or expensive tools than a screw driver. Having just fitted a new set in 2018, we fully expect to need to replace them again within the next couple of years, which is kind of a pain but seems like a better option than trying to find any more durable alternative given that horizontally opening cabinet just do always seem to be a bit more of a challenge to upkeep than the usual, vertically mounted doors. 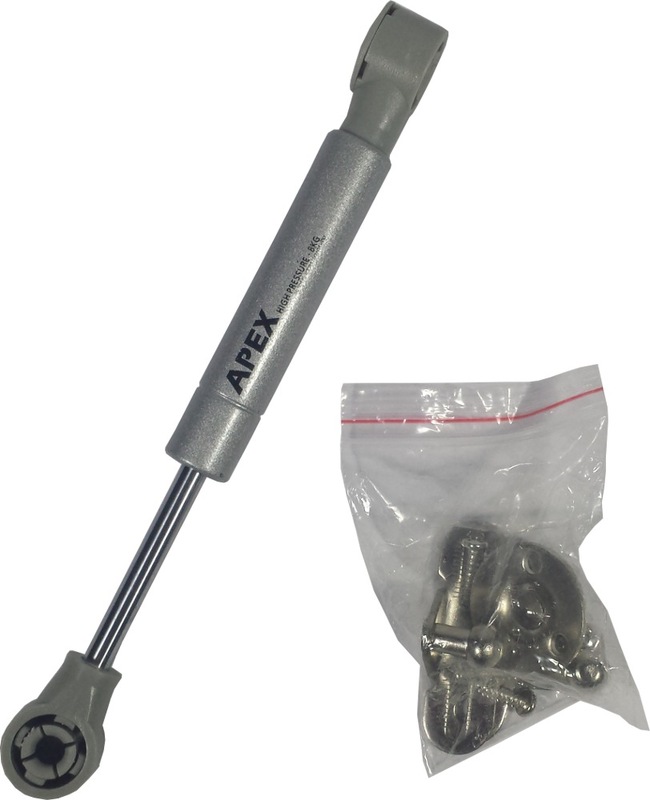 Rated 4 out of 5 by Mark Sea from Apex gas spring Recently, I made a purchase of the Apex gas spring on Sunday and was very satisfied to receive it on the following Monday at their wharehouse in Bigbox, Jurong East. It was well packed and in good condition. Thank you very much for the fast delivery! 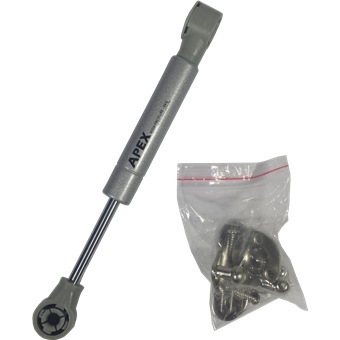 Rated 5 out of 5 by Ki123 from Works great and easy to install I bought this to replace an old pair of "irex High Pressure-530-100M" gas spring at my kitchen that failed after more than 10 years. I was able to use the Apex gas spring as a direct replacement. The screws for the brackets just went on the old screw holes. Installing the gas spring on the brackets was also very easy. Just need to remove the plastic clip to remove the gas spring from the bracket before securing the bracket with screws. Then, just push the gas spring back to the brackets and put back the plastic clips. Rated 5 out of 5 by Bluerabbit from Excellent! Works well for replacement Bought 2 to replace the faulty ones at home. Fit well and value for $$. Rated 5 out of 5 by Terry78 from Good and easy to install Good Location, very easy for self collection and good price .